I smiled when I saw Levi&apos;s face. "You know...stuff." I said as I tasted my finger Dow his body. I got closer to his face, he finally looked into my eyes. I looked at his lips and back into his eyes. I brushed his lower lip with my thumb, he opened his mouth. I smiled and leaned in, putting my tongue in his mouth. Eren put his tongue in my mouth.....he put. He pulled a way and kissed my neck, he slowly unzipped my sweater and pulled it off. I lifted up his shirt and throw it on the floor, and continued to kiss him. He leaned back onto the couch and stopped when he hit the cushions. I messed up his hair as I tried to deepen the kiss, I felt his hands pull at my pant buckle. I removed my hands and undid my buckle, when I was done Eren stood up, and carried me to his bedroom. He dropped me on his bed and climbed on top. I undid his pants and pulled them off, I felt him pull mine down. He rubbed me, causing me to moan. I grabbed the sheets as if it would release the pain coming from my stomach. I jerked my hips up and he forced them down, I clinched my teeth together. I felt myself release into his hand. I let out a sigh of relief, but was stopped when I felt Eren push in. "Levi, I couldn&apos;t resist anymore." He said as he pushed in fully. I squeezed my eyes as he began to thrust into me. He leaned down, kissing softly at my neck. I felt his hot breath going down my neck only to make me shiver and arch my back. He sucked leaving me with multiple hickeys, I licked his neck all the way to his jawline and sucked their. He rammed into me hard which made me yelp in pain and pleasure. He leand his forehead on mine and continued to thrust, I wrapped my arms around his neck bringing him closer. He played his arms on the sides of my head and trusted on last time. "Haaa, Eren!" I groaned as I released onto him. He panted and pulled out, landing right next to me. I smiled at the exhausted Eren next to me. He looked into my eyes and smiled. "No, Thank you," I started to close my eyes ,"Eren." It was now 7:00pm. And Levi is still sleeping, what could I say, I&apos;m a real animal in bed. I looked at the hallway, and smiled as I saw the sight of Levi in one of my sweaters. 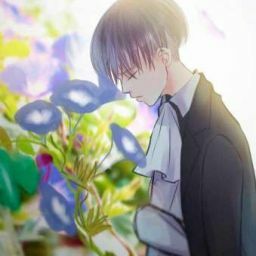 "Good evening Levi." I said as I turned my attention to the TV. "What ever. God Eren, what did you do to me." He said as he rubbed his hips. He placed himself next to me and watched the news. "Eren, Levi~ you two still up?" "Oh, Erwin be nice. Him and Levi probably went at it for a little while." Hanji said as she pushed past me. "I came to celabrate." She said already in the kitchen with Levi, now with the hood covering his ears. Levi looked down, not making eyes contact with anyone in the room. Hanji looked at Mr. Smith and He sighed. A/N: their you guys go. I&apos;m don with this chapter, I hope you guys liked it. Sorry I took long, it just my Mother took my stuff away for the weekend.